1 Preheat oven to 325° F. Thoroughly mix dry ingredients and set aside. 2 Lightly spray a large iron skillet or a 9×13 pan with gluten-free cooking spray. Place skillet or pan in 325° F oven for 10-15 minutes until hot. This will cause the bottom of the cornbread to caramelize. 3 Lightly process corn and cream in a blender to make a creamed corn. 4 Lightly mix butter and sugar by hand. The mix should have small pieces of butter. 5 Add eggs, creamed corn and cheese to sugar and butter. Mix. Try not to break up the cheese. If using, add chilis or jalapenos. 6 Add dry ingredients to the wet ingredients and gently mix. You should see pockets of dry mix and wet mix. This gives the cornbread texture. Do not overwork the batter or the cornbread will become cakey. 7 Pour batter in hot skillet or pan and bake until golden brown. About 20-25 minutes. 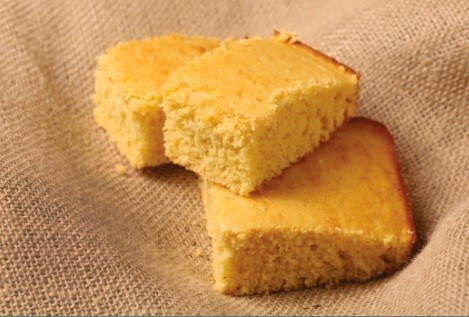 Cornbread is done when an inserted skewer comes out clean. 8 Allow to cool for 10 minutes. Baking time: 30 to 35 minutes. Cooling time: 10 minutes.